The first volume in the Shīʿah Institute Symposia Series, Philosophy & the Intellectual Life in Shīʿah Islam contains the proceedings from The Shīʿah Institute’s first Symposium 2015, comprising a series of studies into the philosophical trends and thinkers associated with the Shīʿī tradition. The volume offers insight into the rich intellectual history in Shīʿah Islam of examining enduring and integral theological, mystical, metaphysical, and epistemological questions. The chapters are broad in scope, commencing from the classical period of philosophical theology and proceeding to examine philosophical aspects of the thought of al-Shaykh al-Mufīd, Mīr Dāmād, and Mullā Ṣadrā, amongst others. The volume aims to make an initial contribution, both by opening up fresh lines of inquiry into the ‘Intellectual Life in Shīʿah Islam’ and by encouraging further research into Shīʿī intellectual history. Saiyad Nizamuddin Ahmad (Ph.D Princeton University) is Reader in Shīʿah Studies at the Shīʿah Institute. He has published a critical edition of Ibn ʿArabī’s Fuṣūṣ al-ḥikam (Cairo, 2015) and edited and introduced John Cooper’s translation of Mahdī Ḥāʾirī Yazdī’s Universal Science: An Introduction to Islamic Metaphysics (Leiden, 2017). Sajjad H. Rizvi (Ph.D Cantab.) is Associate Professor of Islamic Intellectual History and Islamic Studies at the University of Exeter. He has contributed numerous articles to various journals, and is the author of Mullā Ṣadrā Shīrāzī (Oxford, 2007), and Mullā Ṣadrā and Metaphysics: Modulation of Being (Abingdon, 2009). 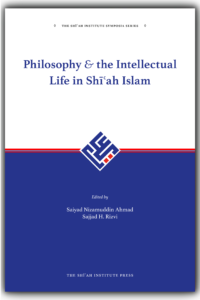 Philosophy & the Intellectual Life in Shīʿah Islam is available to purchase here. The second volume in the Modern Shīʿah Library, Universal Science (ʿIlm-i kullī): An Introduction to Islamic Metaphysics by Mahdī Ḥāʾirī Yazdī, is a concise, but authoritative, outline of the fundamental discussions in Islamic metaphysics. 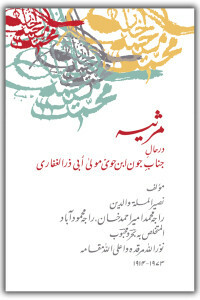 For many years used as a textbook in Iran, this short text offers English readers a readily accessible, lucid, and yet deeply learned, guide through the Sadrian, Avicennan, and Illuminationist schools of thought, whilst also demonstrating how the ‘living tradition’ of Shīʿī philosophy engages with central ontological, epistemological, aetiological, and psychological questions. Discussions include the primacy of existence; the proper classifications of quiddity; and the manifold properties of causality and causal explanation. This is the first of the various influential works authored by this leading Shīʿah intellectual to have been translated into English from the original Persian. Mahdī Hāʾirī Yazdī (1923–1999) (Ph.D. University of Toronto) was an eminent Shīʿah intellectual. He taught at Harvard and Oxford, and was Professor of Islamic Philosophy at the University of Tehran. He was the author of several diverse texts ranging from epistemology to political theory. John Cooper (1947–1998) was E.G. Browne Lecturer in Persian at the University of Cambridge. He studied at Cambridge and the Qum Seminary in Iran. He was the general editor of Encyclopaedia Iranica, as well as a prolific author and translator. Saiyad Nizamuddin Ahmad (Ph.D. Princeton University) is Reader in Shīʿah Studies at the Shīʿah Institute. He has taught at the University of Texas at Austin, contributed to several journals, and is the author of a critical Arabic edition of Ibn ʿArabī’s Fuṣūṣ al-ḥikam. 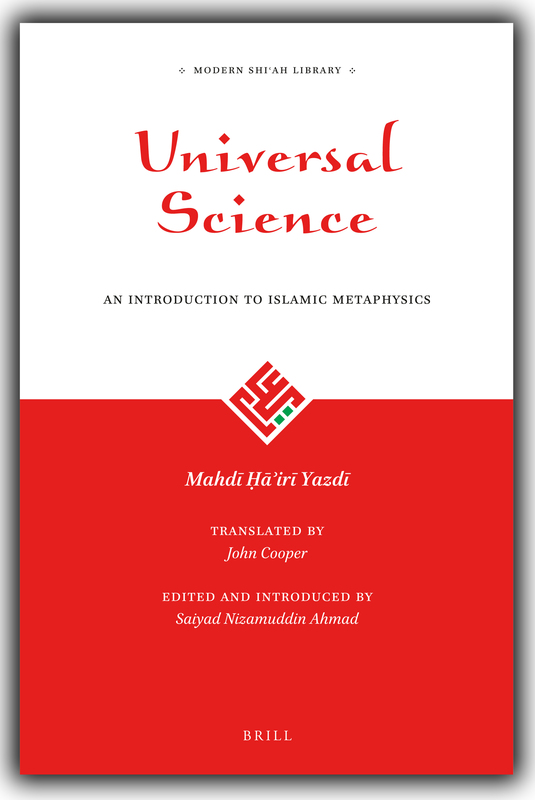 Universal Science: An Introduction to Islamic Metaphysics is available to purchase here. The first work in the Classical Shīʿah Library, Foundations of Jurisprudence: An Introduction to Imāmī Shīʿī Legal Theory, published in November 2016 in partnership with Brill, is a critical edition of the Arabic text with a parallel English translation of Mabādiʾ al-wuṣūl ilā ʿilm al-uṣūl by al-ʿAllāmah al-Ḥillī, introduced, edited and translated by Sayyid Amjad H. Shah Naqavi. Al-ʿAllāmah al-Ḥillī participated in the leading debates of his day and applied his vast erudition in philosophy, logic, and theology to the paramount subject of jurisprudence. This text presents an exemplar of the rich revival of Shīʿī scholarship in the thirteenth and fourteenth centuries of the Common Era. Concise, yet comprehensive, this work sets the standard for the subsequent development and discussion of Imāmī Shīʿī legal theory, such that its influence can be traced through to modern times. This dual-text edition is indispensable for students and scholars of Imāmi Shīʿī jurisprudence. 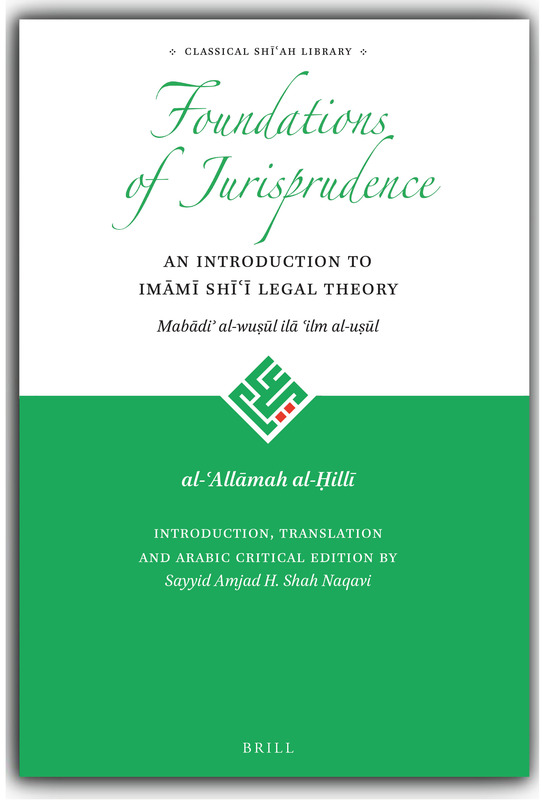 Foundations of Jurisprudence: An Introduction to Imāmī Shīʿī Legal Theory is available to purchase here. Jamāl al-Dīn Abū Manṣūr al-Ḥasan b. Sadīd al-Dīn Yūsuf b. Zayn al-Dīn ʿAlī b. al-Muṭahhar al-Ḥillī (d. 726 AH/ 1325 CE) was an unrivalled scholar of the Imāmī Shīʿī ‘School of Ḥillah’, whose great mastery of the Islamic sciences earned him the unique title of al-ʿAllāmah, or ‘Doctor Maximus’. He applied his vast erudition to the paramount subject of jurisprudence, as well as making important contributions to many other fields of inquiry. 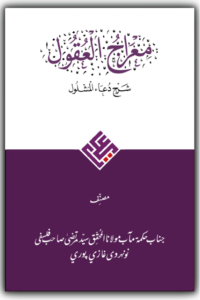 This Arabic critical edition of the Mabādiʾ al-wuṣūl ilā ʿilm al-uṣūl, is edited and introduced by Sayyid Amjad H. Shah Naqavi. It is based on six manuscripts, four of which date from the lifetime of the author. This work by al-ʿAllāmah al-Ḥillī is a testament to the revival of Shīʿī scholarship in the seventh and eighth centuries of the Hijrah. This text sets the standard for the subsequent development and discussion of Imāmī Shīʿī legal theory (uṣūl al-fiqh), such that its influence can be traced through to modern times. This new edition comes with a full Arabic Apparatus Criticus, and will be indispensable for all scholars of Imāmī Shīʿī legal theory. 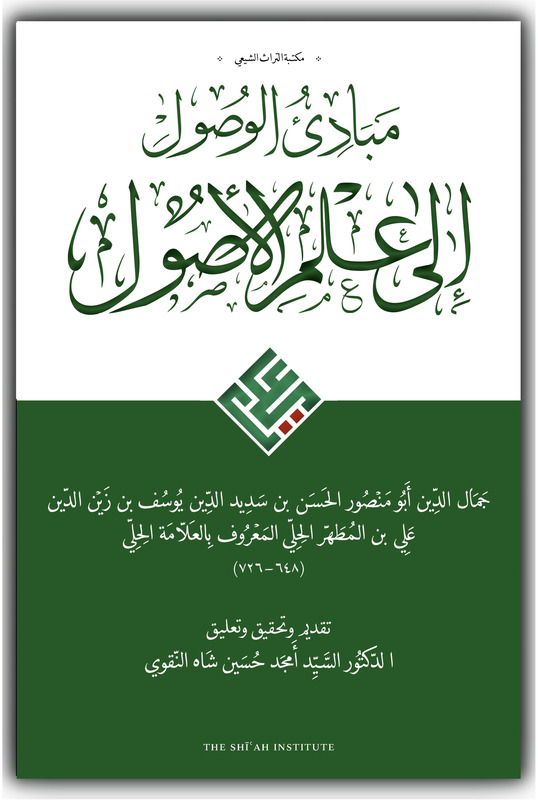 It is the first Arabic critical edition of any of al-ʿAllāmah al-Ḥillī’s jurisprudential works published to date. This work is published by the Shīʿah Institute Press as part of the Maktabat al-Turāth al-Shīʿī Series. The second volume in the Shīʿah Heritage of South Asia Series, Miʿrāj al-ʿuqūl sharḥ Duʿāʾ al-Mashlūl ‘The Ascension of the Intellects: Commentary on the Supplication of the Lame’ by Sayyid Muḥammad Murtaḍā al-Nawnahrawī Ghāzīpūrī (d. 1336 AH/1917), is a comprehensive, recondite treatment of the issues relating to the Divine Attributes, presented in the form of a commentary on a well-known supplication of Imam ʿAlī Ibn Abī Ṭālib (assassinated 40 AH/661 CE). Sayyid Muḥammad Murtaḍā al-Nawnahrawī Ghāzīpūrī was a scholar of singular erudition from Nawnahra, India (near Ghāzīpūr). Educated mainly at the Firangī Maḥall Seminary, he excelled in the mystico-philosophical tradition of Ḥikmah associated with Mullā Ṣadrā (d. 1050 AH/1641) and his teacher Mīr Dāmād (d. 1041 AH/1631). This high-quality digitally enhanced edition of the Miʿrāj al-ʿUqūl Sharḥ Duʿāʾ al-Mashlūl, is the first of its kind that has been published in any form in over a century, during which time it was neglected and largely forgotten. Now, this meticulous edition will finally introduce this seminal theological, philosophical, mystical work to the wider world of scholarship and grant it the audience it deserves. This volume embodies a further elaboration of the school inaugurated by Ṣadr al-Dīn Muḥammad al-Shirāzī (d. 1050 H/1641) in India. It includes a foreword by Sayyid Amjad H. Shah Naqavi, a preface by Sayyid Sajjad Rizvi, and an extensive and illuminating introduction in Arabic, English, and Urdu by Sayyid Nizamuddin Ahmad, Reader in Shīʿah Studies and Head of Education at the Shīʿah Institute. 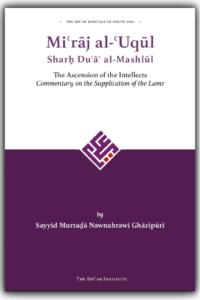 Miʿrāj al-ʿuqūl sharḥ Duʿāʾ al-Mashlūl ‘The Ascension of the Intellects: Commentary on the Supplication of the Lame’ is available to purchase here. the first volume in the ʿĀshūrāʾ Literature Series, The Call of the Free, portrays the events leading up to the massacre of al-Ḥusayn b. ʿAlī, his family, and his companions at Karbala on the day of ʿĀshūrāʾ in 61 AH/680 CE, as seen through the eyes of al-Ḥurr al-Riyāḥī, a man caught between his worldly duty as a soldier of the Umayyad Caliphate and his conscience. In Ṣawt al-Ḥurr al-Riyāḥī, the Iraqi poet and playwright Riḍā al-Khafājī invigorates the historical narrative of al-Ḥurr’s defection, and the turmoil of his conscience, by introducing the character of The Caller—a mysterious voice from the unseen. This adaptation by Sayyid Amjad H. Shah Naqavi of Ṣawt al-Ḥurr al-Riyāḥī into English, employs many characteristic features of traditional prosody and seeks to introduce the long theatrical tradition of Mystery plays in honour of ʿĀshūrāʾ to the Anglophone world, and offers the reader an insight into the rich commemorative practices surrounding the lamentation of the massacre at Karbala. The Call of the Free is available to purchase here. The first volume in the Modern Shīʿah Library, The Mystery of Prayer by Ayatollah Ruhollah Khomeini, completed in June 1939, represents the author’s most original contribution to modern Shīʿī philosophy (ḥikmah) and gnosticism (ʿirfān), a work that draws upon scriptural sources and the Shīʿah intellectual and mystical traditions to engage with the understanding of the higher pursuits of mankind’s reconnection with God. Taking the ritual of prayer as a vehicle for comprehending the nature of reality as a reflection, manifestation, and determination of the divine, The Mystery of Prayer elucidates upon the esoteric dimensions of each stage of the ritual prayer as the wayfarer ascends through degrees and theophanies to arrive in the presence of God. Sayyid Amjad H. Shah Naqavi’s English translation includes extensive explanatory footnotes and a twenty-eight-page introduction that explores the sources, influences, and development of Khomeini’s gnostic concepts and taxonomies in his intellectual milieu. 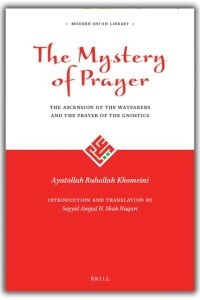 The Mystery of Prayer is available to purchase here. This hitherto unpublished marsiyah composed by Raja Mohammad Amir Ahmad Khan of Mahmudabad is unique for a number of reasons. The subject of the marsiyah is Jawn, an Abyssinian companion of Imam al-Husayn, who was martyred in Karbala. It is the very first marsiyah known to be composed in Jawn’s memory in any language in such length and breadth. Apart from the obvious references to racial equality, the marsiyah demonstrates the author’s deep knowledge of Islamic history and contains subtle metaphysical meditations. Another stylistic feature of this marsiyah is that it contains a saqinamah. The language of the marsiyah, with its rich turn of phrase and verses, that often incorporates allusions of Quranic verses and parts of ahadith, will grip both the academic and lay reader. Mohammad Amir Ahmad Khan, Raja of Mahmudabad, a leading member of the freedom struggle in India, used two noms de plume: Bahr and Mahbub. He composed a number of rubaʿiyat, salams, marasi as well as some ghazals and nazms earlier on in life. He died in London in 1973 and his final resting place is in the holy shrine of Imam ʿAli al-Rida in Mashad. 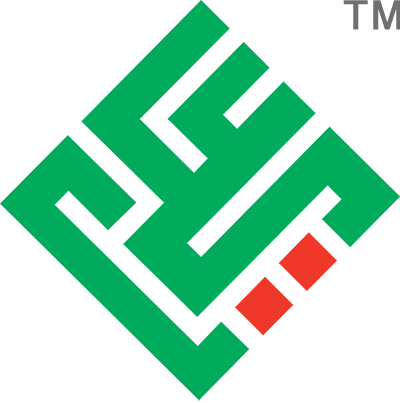 On the 14th of November 2014 this marsiyah became the Shiʿah Institute Press’s first publication and the first volume in the Shiʿah Heritage of South Asia series. This work consists of four rubaʿiyat, a salam of forty verses, and a marisyah of 172 stanzas, adding in total 1,104 verses of poetry to the Urdu literary canon. The book also contains an Urdu introduction as well as a foreword, a preface, and an introduction written in English. 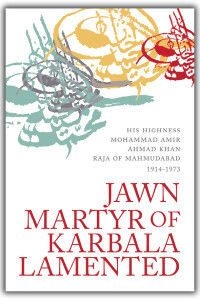 Jawn Martyr of Karbala Lamented is available to purchase here.